Universities and colleges exist to create, manufacture, consume, manage, discuss and disseminate information. It influences every aspect of university life, but is so pervasive that it is rarely seen as something to be considered formally. Recent pressure on universities to create information strategies has led to a new focus on the institutional management of everything from examination questions to research results and student records. In this book, experts from a range of universities consider the issues which universities and colleges have to face in dealing with information. The role of information and what institutions need to do is considered in relation to the major activities of administration, research and teaching. 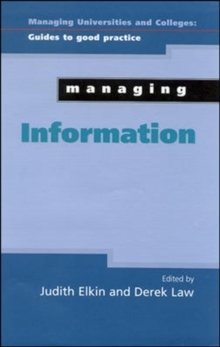 Managing Information is a key resource for both general managers and specialist information managers (of libraries and computer services) in colleges and universities.